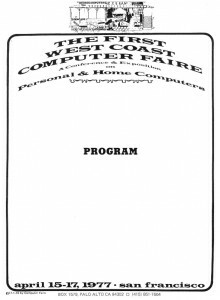 The first annual West Coast Computer Faire is held over three days in San Francisco, California, attended by 12,750 people. The Faire features the debut of the Apple II computer, which features 16KB of memory, BASIC, a built-in keyboard, eight expansion slots, and built-in high-resolution color graphics. Many credit this event and the launch of the Apple II as giving birth to the personal computer industry.